VOCAL offers the G.722.2 Adaptive Multi-Rate Wideband (AMR-WB) vocoder in several forms for use with high quality VoIP applications. Contact us to discuss your G.722.2 vocoder application requirements. VOCAL’s G722.2 AMR-WB voice compression software is optimized for leading DSPs and conventional processors from TI, ADI, AMD, ARM, Intel and other vendors. 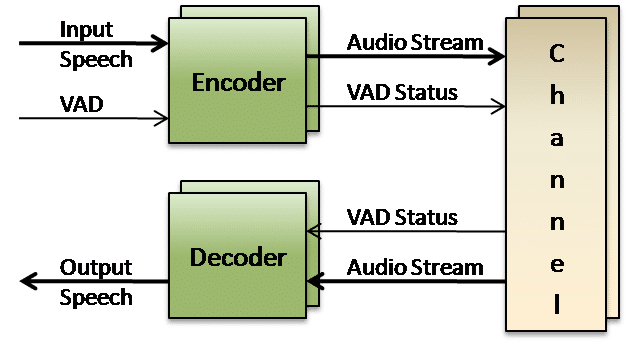 Our G.722.2 speech coder may be licensed as a standalone voice compression algorithm, as part of a modular software library suite, or with a VoIP stack. Custom designs are also available to meet unique voice codec requirements for our clients. The G.722.2 AMR-WB algorithm is used as an internet wideband audio codec for VoIP applications with an audio band of 50 – 7000 Hz instead of the 200 – 3400 Hz used with traditional telephony. The increased bandwidth improves the intelligibility and naturalness of speech significantly. G.722.2 describes the detailed mapping from input blocks of 320 speech samples in 16 bit uniform PCM format to encoded blocks of 132, 177, 253, 285, 317, 365, 397, 461 and 477 bits and from encoded blocks of 132, 177, 253, 285, 317, 365, 397, 461 and 477 bits to output blocks of 320 reconstructed speech samples. The coding scheme for the multi-rate coding modes is the so called Algebraic Code Excited Linear Prediction Coder, hereinafter referred to as ACELP. The multi-rate wideband ACELP coder is referred to as AMR-WB. G.722.2 also utilizes an integrated Voice Activity Detector (VAD). The sampling rate is 16 000 samples/s leading to a bit rate for the encoded bit stream of 6.60, 8.85, 12.65, 14.25, 15.85, 18.25, 19.85, 23.05 or 23.85 kbit/s. Annexes A and B and Appendix I provide supplemental functionalities allowing interoperability with GSM and 3GPP wireless systems. These functionalities have originally been developed for these systems, but their use is not limited to mobile applications. Two other Annexes D and E describe test vectors and frame structure respectively. VOCAL’s optimized vocoder software is available for the following platforms. Please contact us for specific G.722.2 codec supported platforms.